If you are intending to launch a site that’s loaded with cutting-edge features, you need to use professionally designed premium themes. To help you with the job of finding and picking such a theme that meets your requirements, here is a list of top 30 premium WordPress themes. 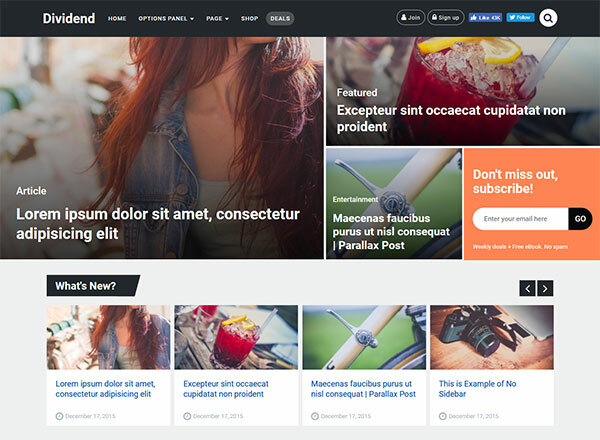 Dividend is a multipurpose WordPress theme that can be used for creative blogs, magazines, and deals websites. The theme comes with 7 post layouts, 4 pagination types, 3 sliders, and 14 custom widgets for anyone who would like to offer custom deals on their website. There are plenty of add-ons that come with the theme to make it highly functional and visually appealing. 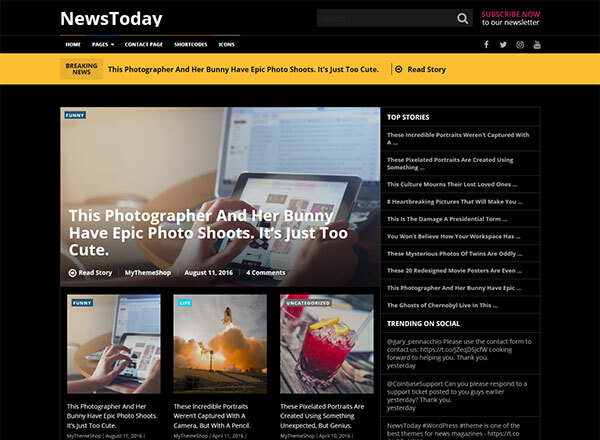 If you are looking for a magazine WordPress theme that speaks of elegance and delivers the best reading experience, NewsToday is a decent option. The theme suits websites in the niches like newspapers, politics, breaking news, gaming, technology, travel, sport, etc., but it can be adapted easily to go well with other niches too. Scorn is a clean portfolio theme that most hosting service providers, agencies, and freelancers want. But that doesn’t mean it requires expert knowledge of web development to set it up as the theme comes loaded with a Drag-and-Drop Page Builder which makes getting up and running with a website quite hassle-free. Apart from that, there are 9 different homepage styles, 7 header styles, sliders and all the add-ons that you would normally expect from a premium WordPress theme. 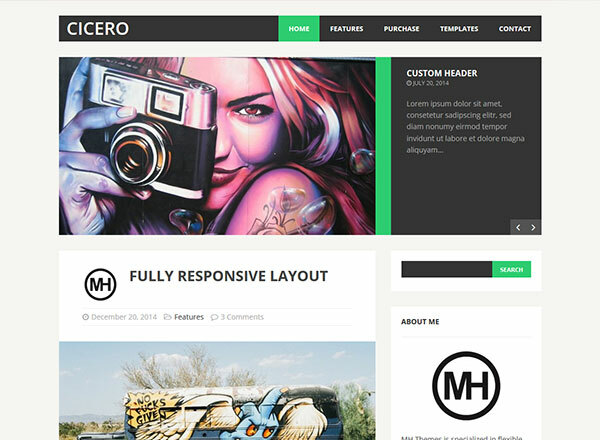 MH Cicero is a WordPress theme for webmasters who like the minimalist flat styled design. Since the theme is very versatile, it can be used equally well for both creative WordPress blogs as well as business websites. The theme is highly responsive, SEO friendly and comes with a built-in theme customizer and child theme support. As the name suggests, Viral is a theme designed keeping the needs of a viral blog in mind: speed and readability. 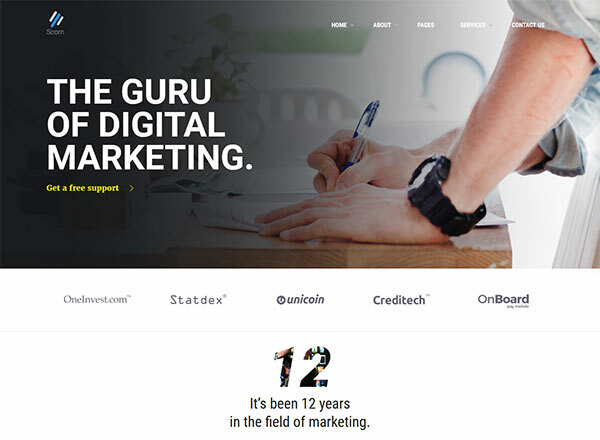 The theme comes with 3 post layouts, carousel and galleries, social plugins, and other theme customization options that make the task of creating a viral website a bit straightforward. 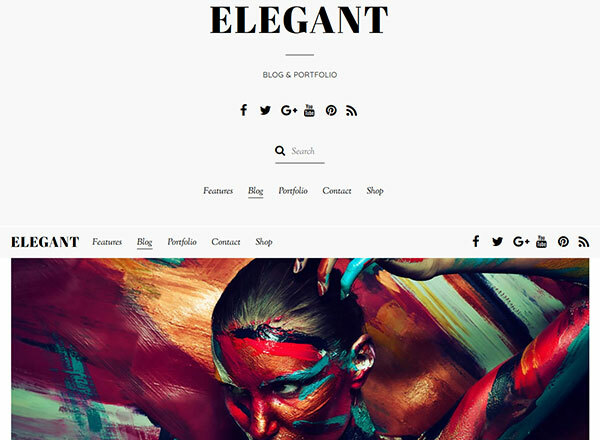 Elegant theme lives up to its name and comes packaged as a multipurpose theme with a focus on readability. Minimal design and typography are its key features, and the theme also has a bonus Portfolio layout, image filter feature, and several innovative layouts. This makes this theme perfect for all kinds of artists, be it designers or writers. It’s a great option for showcasing portfolios for both individuals as well as creative agencies. 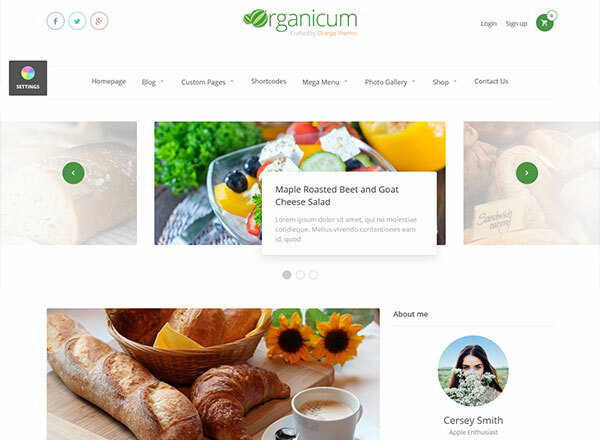 Organicum is a premium WordPress theme that offers features like one-click install, advanced drag-and-drop page builder, clean and secure code, and many add-ons. It’s fully responsive, SEO friendly and supports WooCommerce integration. The creators of this theme suggest that it’s a neat choice for food bloggers and online health store owners, though if you appreciate the simplicity and ease-of-use that’s characteristic of this theme, you might as well use it for similar niches if you please. 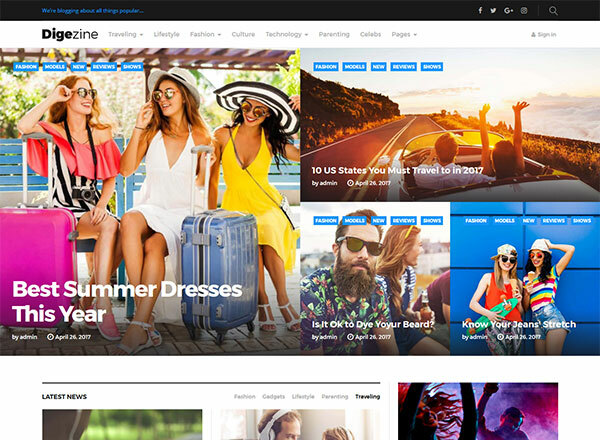 Digezine is a modern magazine theme designed as per the latest trends in web design. The theme offers a live customizer to make any changes to the pages and layouts and make them appear just as you would like them to. There’s no dearth of custom widgets that support this theme, and there’s also an option to get up and ready with a free Ecwid store within just minutes. 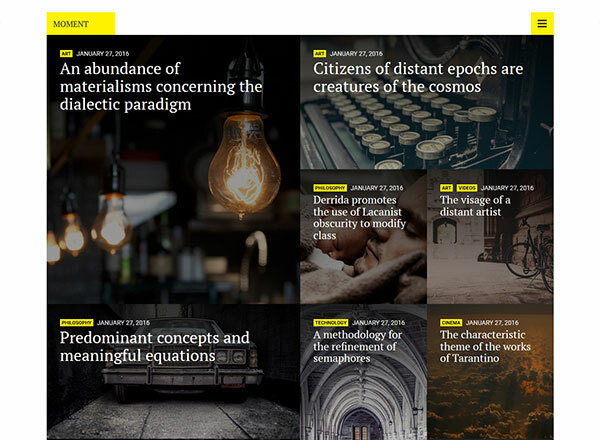 The best part is, the theme makes magazine type of websites look particularly gorgeous. 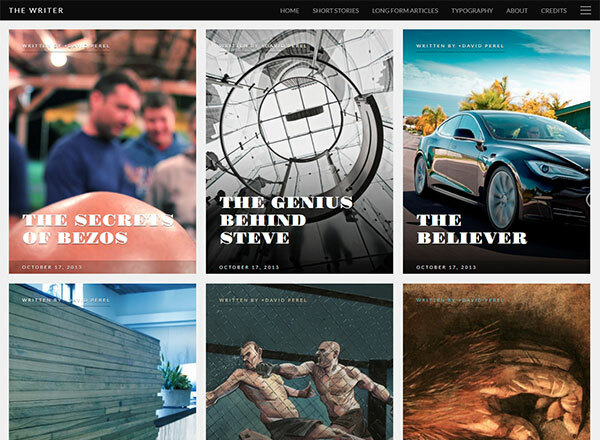 If you intend to set up an online magazine, you should check out SevenMag. It’s a WordPress theme based on flat and modern design elements that make it stand out from the rest. Though it’s certainly a nice option for magazines, it also works well for news, gaming, blogging, and review websites. Apart from a visual page builder, sliders, and custom widgets, what makes the theme perform even better is its fast page load speed, responsive design, and clean code. Clean is another elegant yet minimalistic theme that’s loaded with features. It’s quite versatile and flexible so that you can use it for just about any kind of website making it a multipurpose choice. The theme comes with 3 homepage layouts, 4 slider types, custom widgets and WooCommerce compatibility among a host of other features. 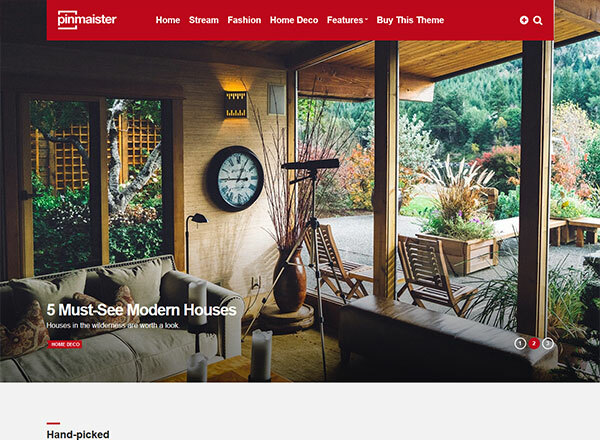 Pinmaister is a unique modern WordPress theme that can make any plain boring website resemble the layout of Pinterest. It’s quite easy to setup and offers plenty of customization options, which makes it great for webmasters who want a sleek look for their fashion or professional blog. 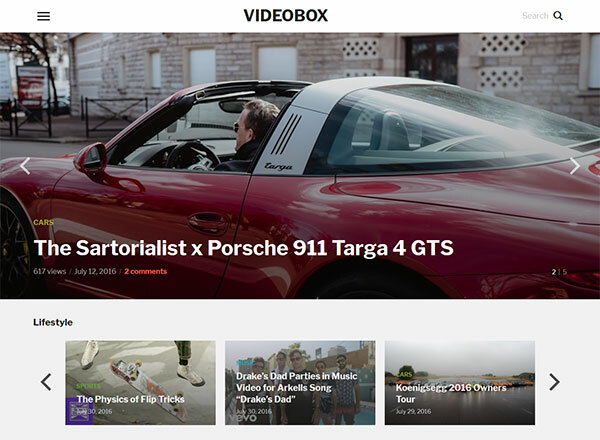 If you want a site that will be used to share video content, try out VideoBox. It supports video embeds from almost every popular video site, so it makes sharing video content from YouTube, Vimeo and Dailymotion almost hassle-free. The theme, in addition, comes with a featured slider, carousel support, and infinite scrolling mode. 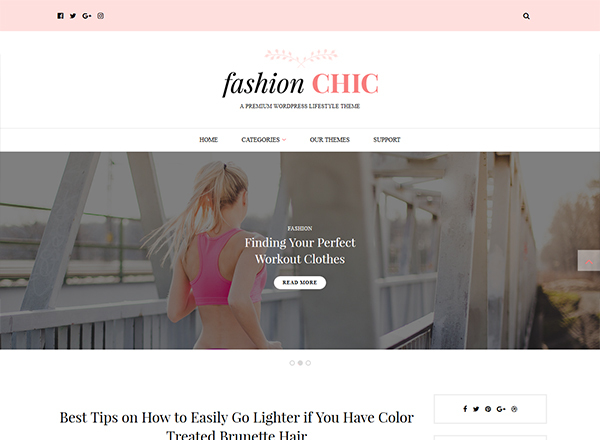 As the name intends, this theme was created for blogs in fashion and lifestyle niche. The clean design and subtle style of the layout make it stand out for professionals who like their readers to have a clutter-free experience. In addition to this, the theme has all the features that you would normally expect from a modern premium WordPress theme, including but not limited to: responsive design, ad-support, full customization options, and custom widgets. 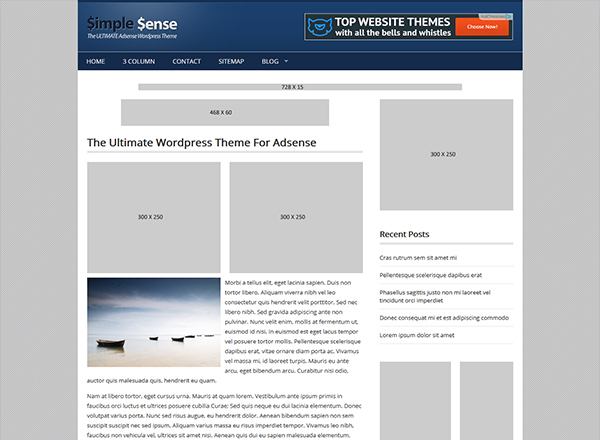 Simple Sense is a premium WordPress theme that caters specifically to professionals who want to gain maximum control over the revenues that their websites generate from Google AdSense. With 12 effective ad positions, per-post-ad-options, custom layout options and cross-browser compatibility, it is one of the best choices available in the market if the majority of revenue your website generates comes in from AdSense. 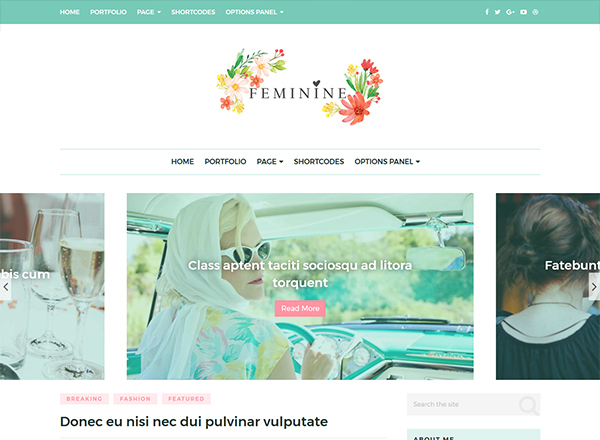 For niches with a female audience, Feminine is a girl-oriented theme that can go well with any website that requires a feminine look and feel to it. 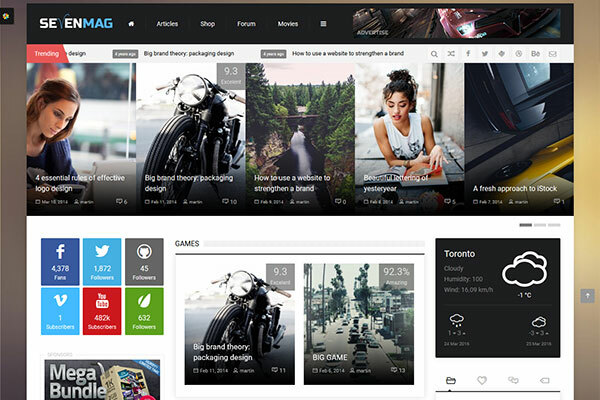 The theme comes with 3 post layouts, 3 slider layouts, 14 custom widgets, and also a portfolio layout. Not just this, it also supports one-click installation and plugins for Instagram, WooCommerce, and AdSense support. 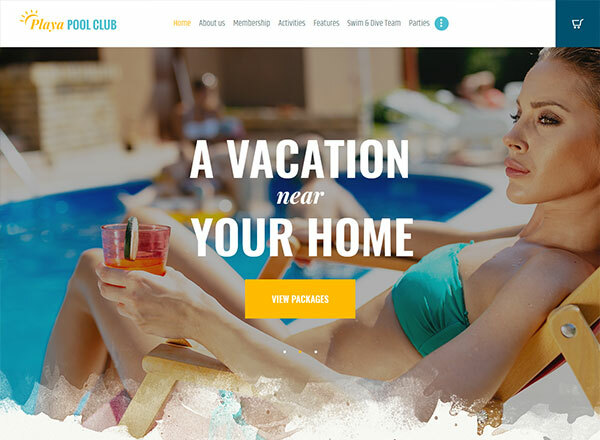 Playa is a premium WordPress theme that caters to the category of outdoor clubs, hobby groups, resorts, water parks and the likes who would like to present a fun, bright and visually appealing look to their website. With a one-click demo install and just a few edits, you can test out this theme in almost no time. The theme offers Visual Composer and Slider support along with 750+ customization options. 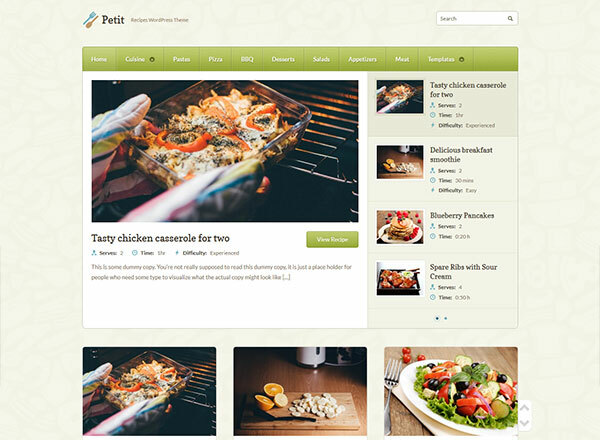 Petit is a premium WordPress theme that showcases your food-related content with simplicity. It’s well suited for recipe websites and food blogs since the theme supports recipe shortcodes to make the job of food bloggers a tad bit easy. The theme doesn’t lack visual appeal, and there is carousel support and Instagram plugin to keep the readers engaged with your content. 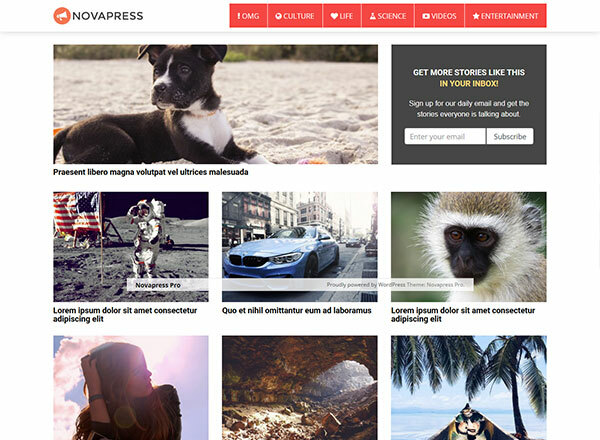 Novapress is the kind of WordPress theme that viral websites are built on. 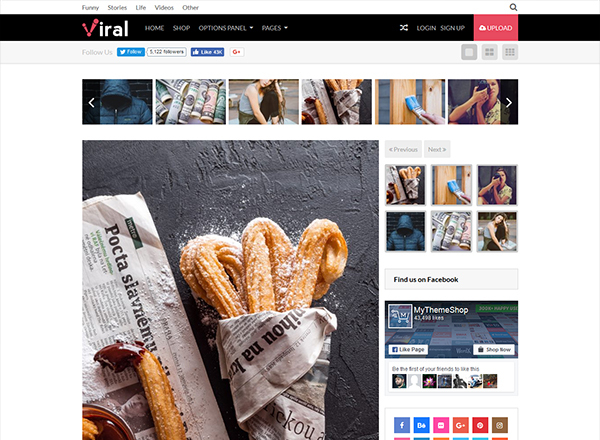 If you plan to start your viral blog or news site, this theme is worth checking out! It has all the requisites of trending modern websites such as responsiveness, social sharing, and infinite scroll. The theme also makes customization and ad monetization easier for the webmasters who want their website to go the long mile. There are only a few of themes that mix elegance and readability the way The Writer does. It will certainly be appreciated by the fans of modern and flat design principles. 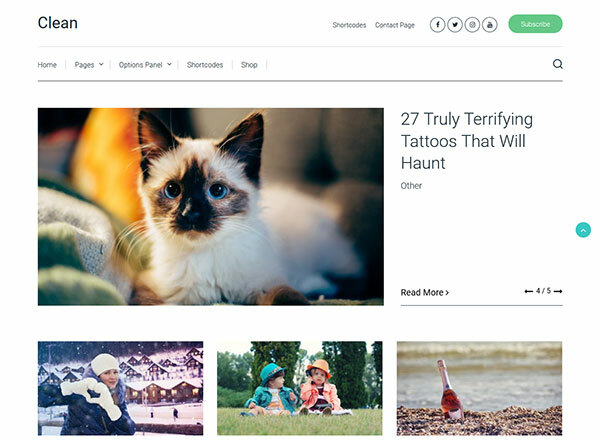 Also, all the customization options that come with this theme make it one of the best premium themes for hobby bloggers, writers, journalists and authors who love to share their content! 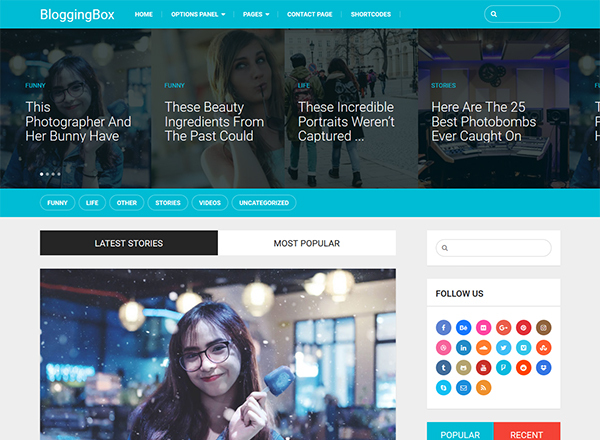 Though BloggingBox is a blogging theme for WordPress, its features make it a multipurpose option. The theme offers customizability, shortcodes, custom widgets and most importantly – speed. It also supports parallax, carousel, AdSense, and WooCommerce integration. BloggingBox is search engine friendly and fully responsive as well. Moment is yet another premium WordPress theme for bloggers who like masonry layout over other types of layout. The theme has been developed for speed and search engines, plus it offers 4 post layouts and has fully customizable theme options. 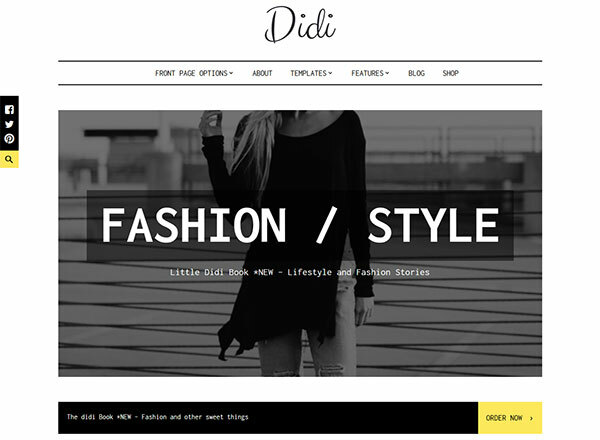 For the fans of clean design and flat style, Didi is a must-try theme. Its creators call it a blogging theme, though you will find it a good match for an online store too, thanks to its WooCommerce support! Just like most of the other top premium WordPress themes in this list, it has been optimized for performance, supports 1-click install, and offers live customization feature. 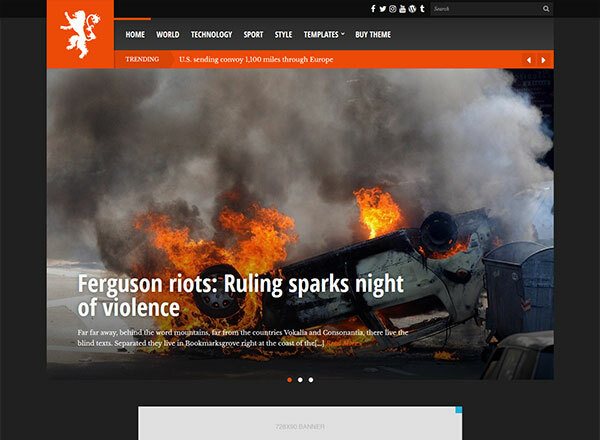 Tabloid is a professional looking theme for news and magazine sites that comes in two flavors: light and dark. The theme is visually appealing, and it offers webmasters plenty of ad space for monetization and options for customization. 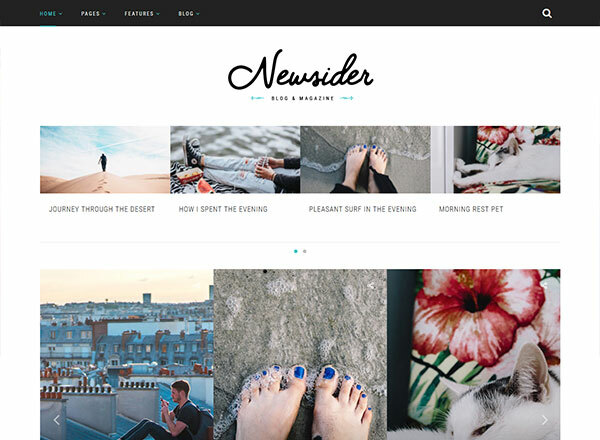 If you were looking for a modern and stylish theme with a clean design for your news or magazine website, Newsider is a WordPress theme that might impress you. It’s a good option for fashion or travel related blog. It’s quite easy to customize and takes just a few minutes to set up. Coupon is a professional theme created specifically for the websites in the coupon niche. 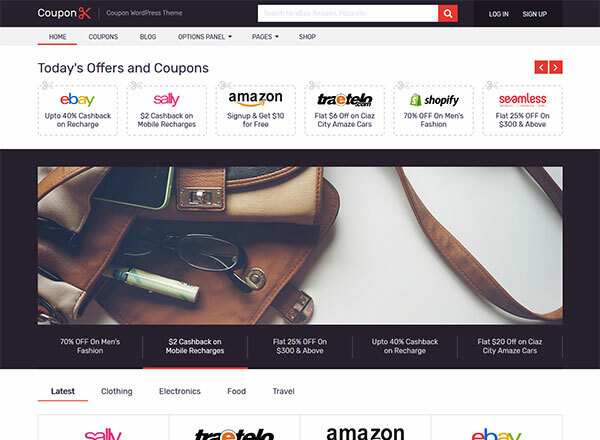 This theme simplifies the process of getting up and running with a coupon website. It offers support for multiple promotion types, coupon expiry date, extra reward options, recent offers, and coupon archives. Apart from this, the theme also supports WooCommerce integration, which means you can also use this to operate your online store. 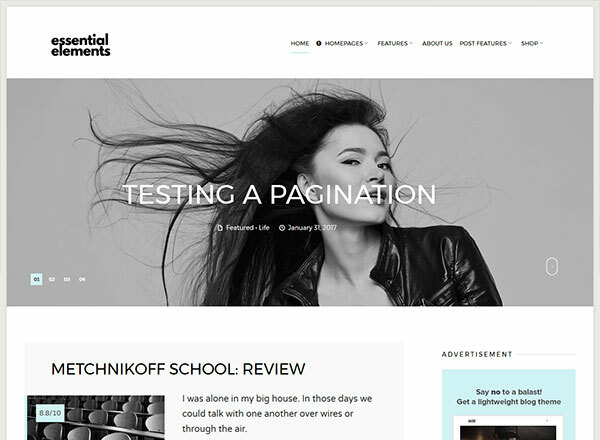 Essential Elements can be called a minimalistic blog theme, but it stands out from most themes in its category because of its strikingly clean and modern design. Regardless of whether you use it for a personal blog or a professional one, Essential Elements will not let you down. It’s fully responsive and supports WooCommerce integration. 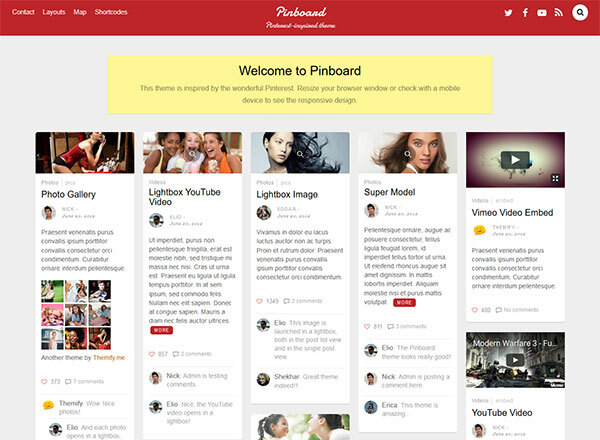 Pinboard is a Pinterest lookalike theme for WordPress. It supports infinite scroll feature similar to that of Pinterest’s desktop website. The theme is fully responsive and even supports multisite integration to allow users to signup, post, and share content on the website. 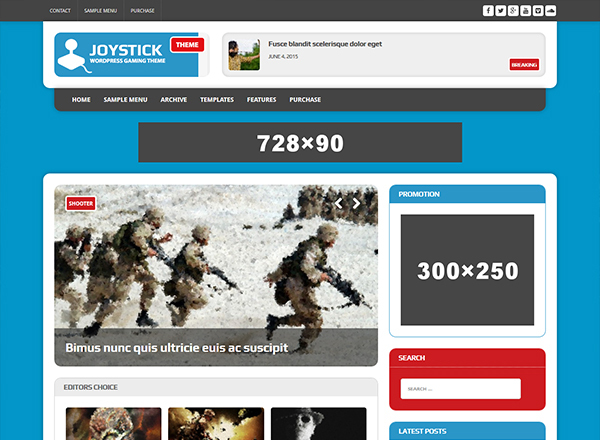 MH Joystick is another great blogging theme that suits magazine, gaming and reviews websites. But regardless of the niche, the theme will deliver a good reading experience for the readers and be easy to customize for anyone who wishes to use it for their blog. It’s also loaded with plenty of widgets and plugins to make use of, and for increasing your blog’s readership. 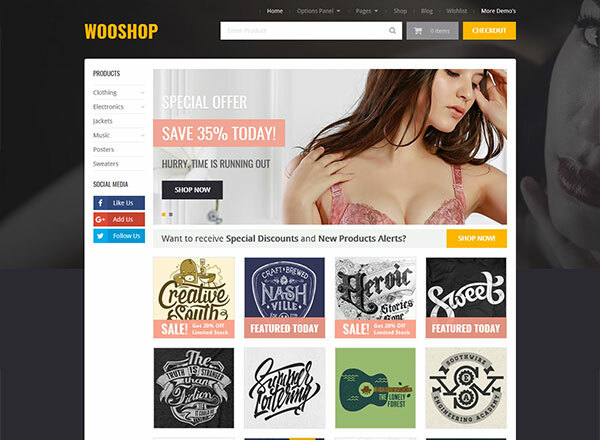 WooShop is a sleek WordPress theme for WooCommerce based online stores. Its unique, beautiful, and professional homepage design makes the theme stand out from other similar themes. In addition to this, the theme has all the features that you would expect from any of the top premium WordPress themes currently available in the market. 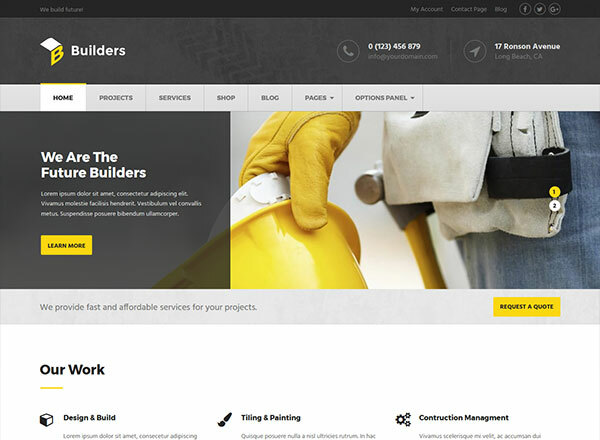 For those looking for a premium WordPress theme that will go well with their website in the construction or remodeling niche, Builders ranks as one of the best. The theme comes with a separate portfolio section to showcase your past projects and blog section to share your expertise with your clients. It supports WooCommerce integration, so you can also sell tools or equipment via your website. 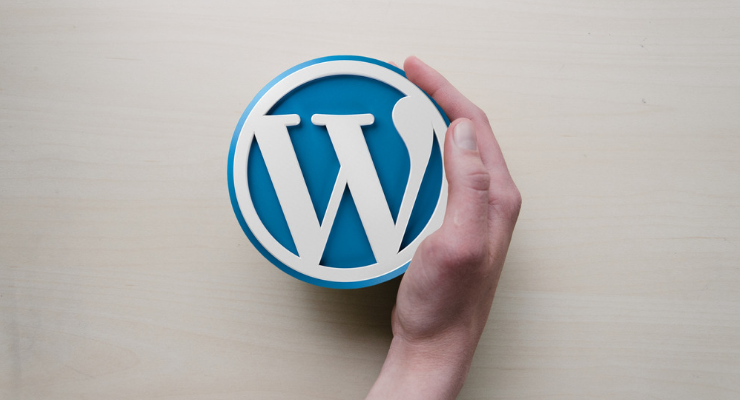 Multiple elements go into consideration when you are selecting the right theme for your WordPress blog or website; it can be confusing to pick just one. Having said this, it never hurts to try out a demo of the ones that you like and see which one is the ideal match for your project. This post was written by Sunalini Rana, a working mom who left her stable career as a human resources manager to pursue her dream of becoming a professional blogger. She’s self-taught in web design and photography, and always loves learning new things and helping others along the way. She also has an unhealthy passion for delicious food like pizza and burgers.